The PT-RZ12K projector is an innovative piece of equipment which takes laser projection to a whole new level. This is ideal for large conferences, exhibitions, theaters, product and app launches. With combined 12,000 lumen and the 3-Chip DLP™, as well as the Solid Shine Laser technology, emanates in minimal picture quality degradation over long periods in continuous use. Running time can be up to 20,000 hours, with fail safe reliability. The PT-RZ12K has a large range of powerful features in order to produce creative visual presentations in large spaces. A liquid cooling system for the light source features a new air intake and solid aluminum radiator to suppress temperature rises, allowing stable operation in high temperatures while reducing noise, meaning there is no worry of the projector over-heating and shutting down. The incorporation of the Real Motion Processor delivers a better sense of resolution, contrast, and fluidity of motion, with the interpolated frames produces a high quality and more fluid moving image with up to 120 frames per second. The digitial link single cable solution makes this laser projector ideal for a quick set up, reducing cabling and enhancing reliability. Geometry Manager Pro software in the projector extended the image-adjustment functionality and makes complex multi-screen setup easy. 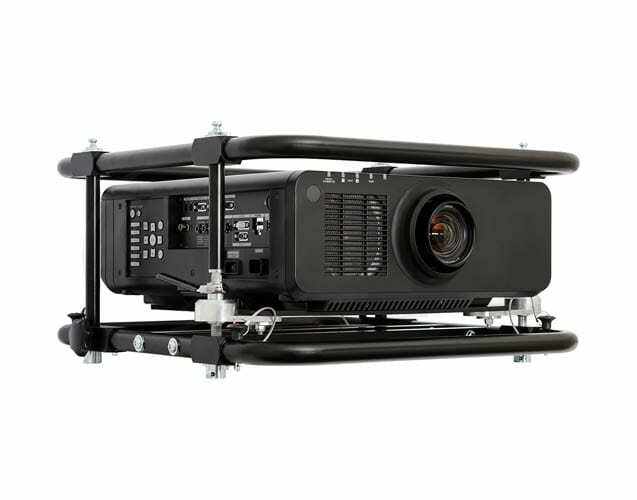 The software includes colour matching, edge blending, and many other functions, our technicians will always ensure that the projector is set-up to enhance the image or footage you wish to display to the highest quality, the PT-RZ12K makes this possible and will always have the highest definition.